Our formaldehyde free GWT pigments are available in 10 colors! Do you prefer to use pigments free of formaldehyde? Our GWT series are fluorescent pigments free of formaldehyde for water based formulations for paints, paper and textile. GWT has ten colors, including magenta. This means that the color palette is complete. What’s new? There is now a formaldehyde free alternative for every color from the old JST series and even more (blue and purple). So nothing keeps you from switching to the formaldehyde free GWT series! In doubt? Ask your free samples. In comparison to JST, GWT is free of formaldehyde and offers more colors including blue and purple. Recently, Magenta (GWT-18) completed the color portfolio. If you prefer a 50% water dispersion, WT-18 is at your disposal. GWT-18 (Magenta) is the formaldehyde free alternative for JST-18. GWT-18 is developed and commercially available in 20kg carton boxes (MOQ: 20kg). GWT-18 is a stock keeping product (service level A). In case of non-availability: 2 weeks from order's receipt. A 50% water dispersion of GWT-18 is commercialized as WT-18. Packed in 50kg pails (MOQ: 200kg) and produced on order with a minimum take-off of one batch size. Availability: 4-6 weeks from order's receipt. Download the technical data sheet of GWT and WT. Like us on Facebook and be the first to hear any news! 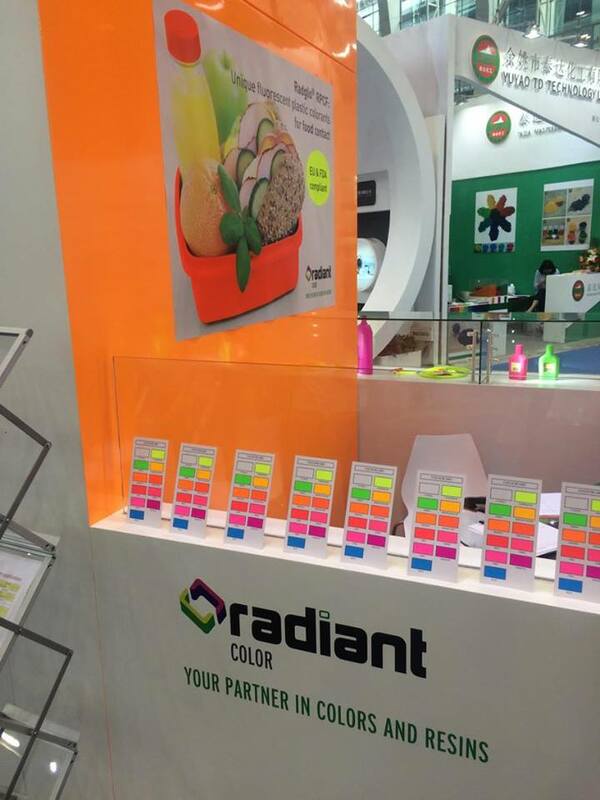 Radiant Color is mainly known for its fluorescent pigments, but also develops smart functional solutions. Did you know we offer a large assortment of UV-blue and UV-green tracers? They are invisible in normal daylight, but produce a bright blue/green color in UV light. By incorporating a tracer in or on your product, quality control can be automated. Some critical application are controlled with the human eye, whereby the chance of error is bigger than an automated process. By incorporating a tailor made tracer inside or on the product, it is possible to detect remnants with optical machinery and sort them out. A much more efficient way of working! Thanks to tracers, invisible cutting lines can be applied on f.e. plastic sleeves for drinking bottles. In this way, the plastic sleeve is always cutted in the right size. The invisible cutting lines are invisible for the human eye but detected by the cutting machine. Tracers can also be incorporated in adhesives, glues or silicone. They help to inspect quickly and accurately your products. By incorporating a tracer, you mark them in an invisible way. The use of tracers has several advantages: a fast and accurate detection of (production) errors and a more efficient production and management of your products. Consequently they help your company save time and money. Radiant Color offers a large assortment of tracers for different kind of applications: dyes, toners, pigments, inkbases and colorants. Curious about the numerous possibilities of tracers, or have a question? Get in touch. Big news: Radiant Color improved the color strength of one of its best selling thermoset fluorescent pigments. Radglo PS-4* series are already commercially available and will replace completely PS-1*/3* series by April 2018. Compared to the PS-3* series, Radglo PS-4* series offer more color strength. All other parameters such as migration, light fastness, chemical and solvent resistance and reflection remain the same. Substitution can be made easily by taking into account the color strength difference. It will be possible to create more performing fluorescent colors, or reducing pigmentation and still keep the same fluorescent effect while reducing the formaldehyde content. Be prepared, Radglo PS-4* series will replace completely our PS-1*/3* series by April 2018. You can order the PS-1*/3* series until March 2018. From April 2018, Radiant Color will stop production of PS-1*/3* series and will switch to Radglo PS-4* series. The PS-4* series are already fully commercially available. Remark: As Radglo PS-30 (Chartreuse, reddish shade) already has a color strength in line with the PS-4* series, Radglo PS-30 will remain and will be promoted also after April 2018. Additionally, from the 1st October 2017 the service level of the PS-1*/3* series moved from service level A towards service level B (partially stock keeping products). 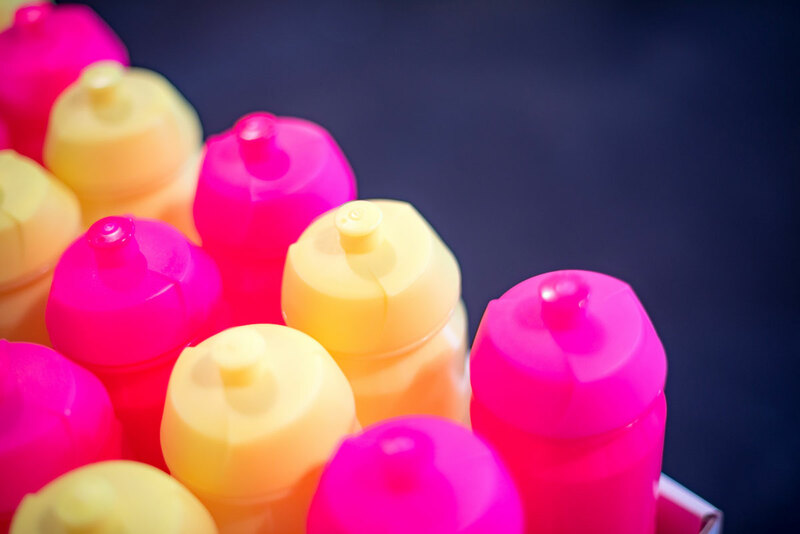 The demand for fluorescent pigments with a low – or even no – formaldehyde content is increasing substantially. In this respect we think about textiles, sporting goods, paper coating, paints etc. For these kind of applications, we already offer fluorescent pigments free of formaldehyde (click here). 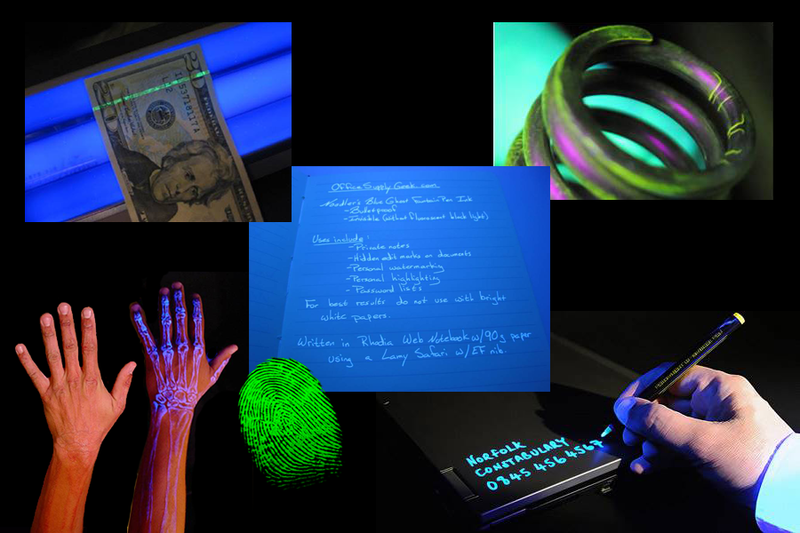 Nevertheless, the traditional TSA (toluene sulphonamide) technology, – which includes formaldehyde - still results in the best performing fluorescent pigments. Therefore Radiant Color improved – based on market demand - the color strength of one of its best selling formaldehyde containing fluorescent pigments, Radglo PS series. Good luck on making the switch with us! For more information or samples, we are at your disposal. Feel free to contact us! 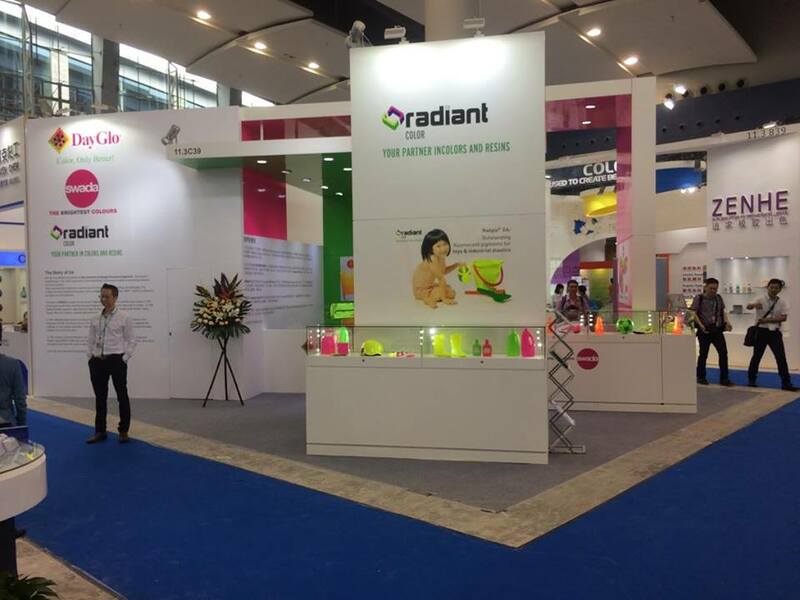 Already a highlight of 2017: Radiant Color exhibited for the first time at CHINAPLAS in Guangzhou, China. CHINAPLAS is the largest plastics and rubber trade fair in Asia. It is also widely recognized by the industry as the 2nd most influential exhibition in the world. The ideal place to promote our innovative products. The 31st International Exhibition on Plastics and Rubber Industries in May was an overwhelming experience! 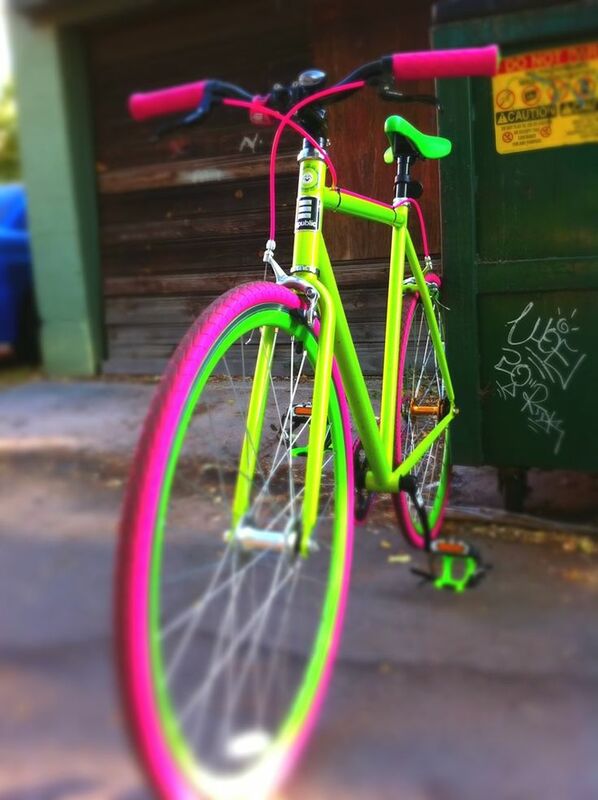 Our mission: the successfully promotion of our fluorescent plastic colorants Radglo® RPCF and Radglo® EA. Why do we think people must discover Radglo® RPCF? 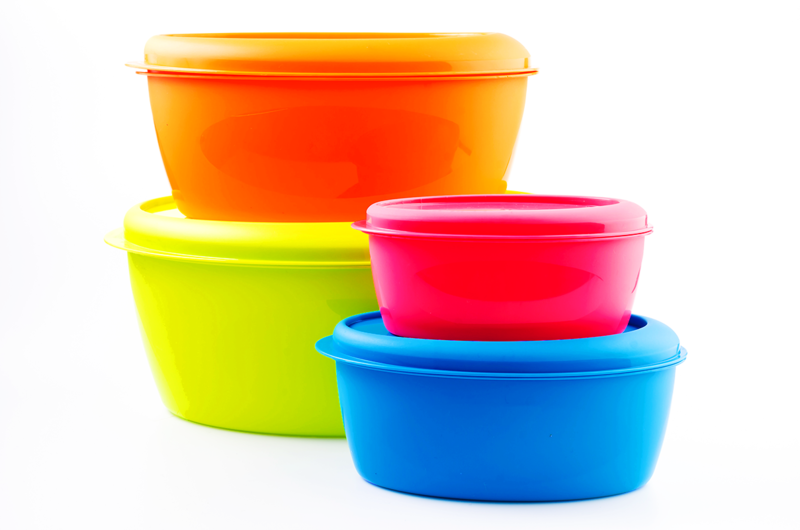 These daylight and ultra-violet fluorescent plastic colorants for food contact applications are the first fluorescent plastic colorants in the world with both EU and FDA compliancy. An important asset! The production of fluorescent plastic food packaging can be done in China but end use need to be in Europe or the USA. Attractive stand, plenty of visitors (155.258!) and interesting business contacts … Expectations fulfilled! Together with our sister companies DayGlo and Swada we had the biggest fluorescent booth of 64m2. We are already looking forward to the next exhibition. 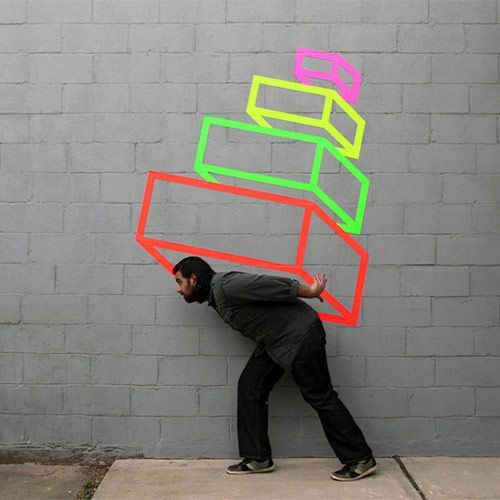 Curious about the numerous possibilities of fluorescent pigments, or have a question? Get in touch. As innovation is our driving force, we proudly introduce Radglo® RPCF. The first and only fluorescent plastic colorant with both EU and FDA compliancy. Plastic food packaging can be perfectly colored fluorescent. Thanks to Radglo® RPCF it can be done in a safe way and in compliancy with the food safety regulations. 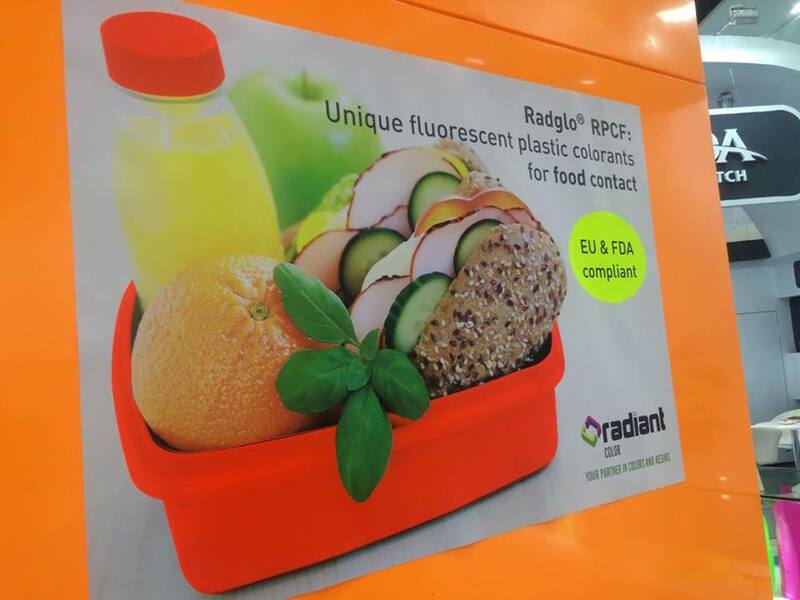 Radglo® RPCF is the only fluorescent plastic colorant in the world with both EU and FDA compliancy. When it comes to health, Radiant Color likes to play it safe. Radglo® RPCF is officially launched during ‘The European Food & Beverage Plastic Packaging' in Berlin. 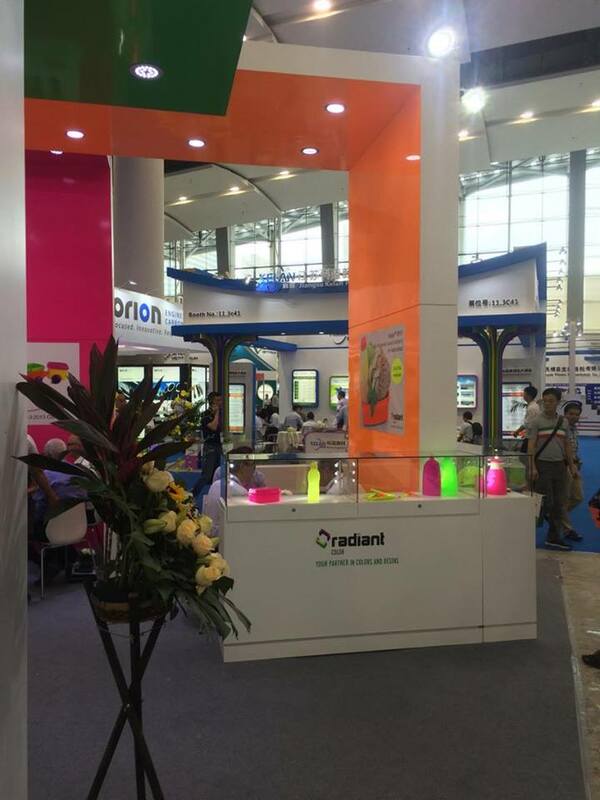 Thanks to this innovative product, Radiant Color was invited as guest speaker to introduce Radglo® RPCF to the main players in the plastic industry. First fluorescent plastic colorants in the world with both EU and FDA compliancy. In compliance with European plastics regulation (No 10/2011/EC) and European safety requirements: up to 1% in LDPE, HDPE, PP for single and repeated use applications in contact with all food types at room temperature or lower. In compliance with Food and Drug Administration status (FDA): up to 1% in HDPE, PP for single and repeated use applications in contact with all foods under conditions of use E-G defined in 21 CFR 176.170(c): room temperature filled and stored, refrigerated storage and frozen storage (no thermal treatment in the container). Recommendation letter from Keller and Heckman for EU and FDA status available on request. Outstanding temperature and light resistance and negligible (if any) plate out. For more information or samples, we are at your disposal. Contact us. 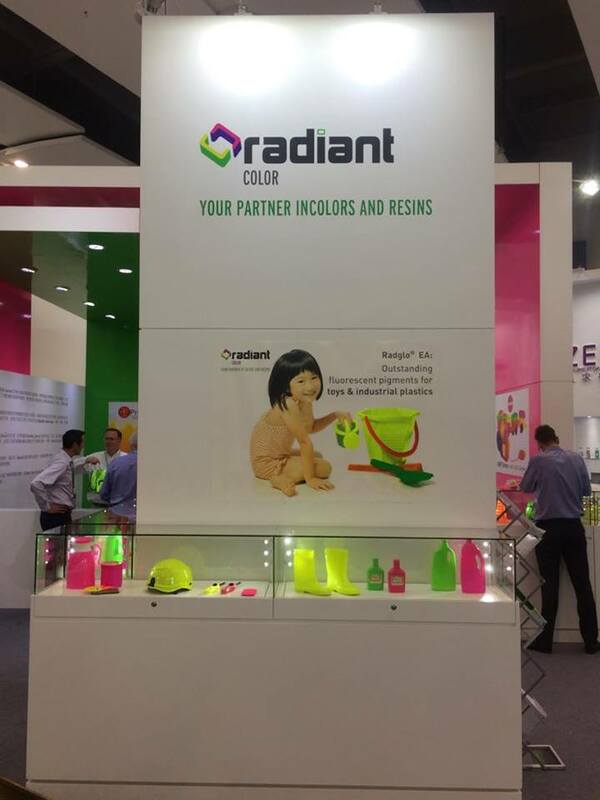 Radiant Color is European market leader in the development and production of fluorescent pigments. Our innovative company exports to more than 60 countries worldwide and emphasizes partnership, co-creation, innovation and service. 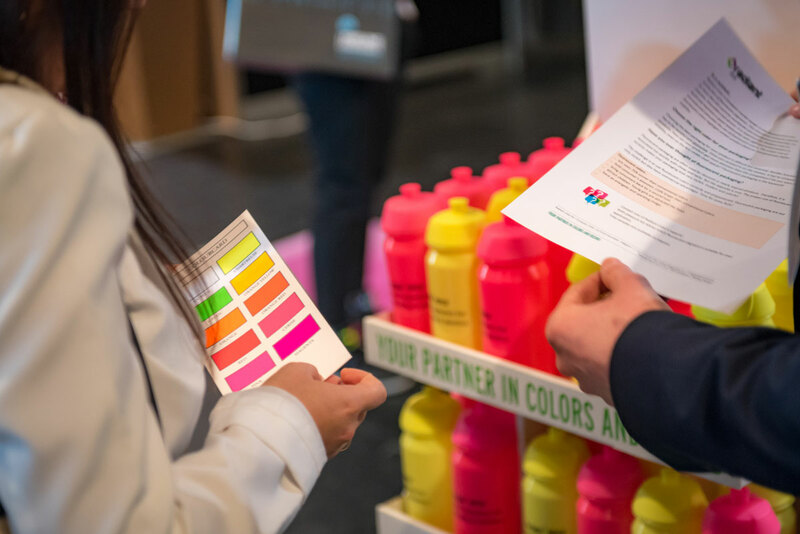 Radiant Color catches the eye at Packaging Innovations Amsterdam. Innovative and original means of packaging are what Packaging Innovations is all about. 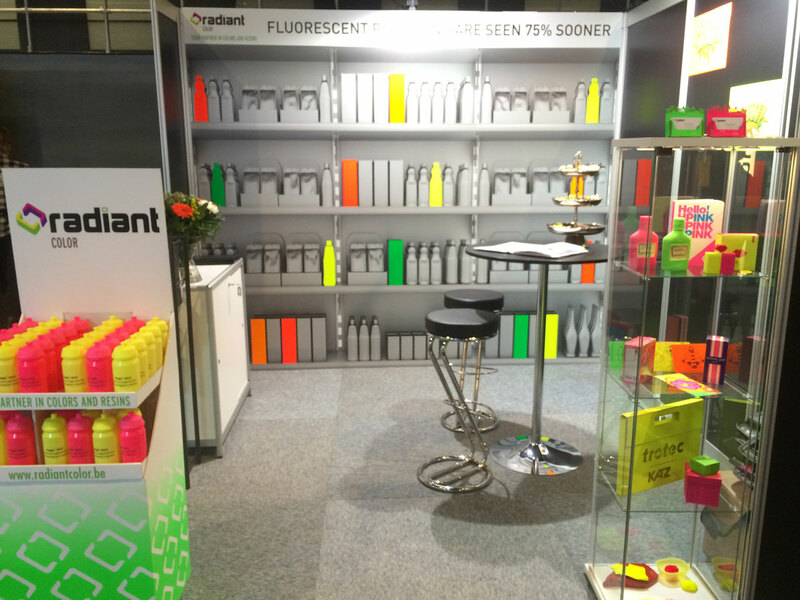 Radiant Color had a flashy stand at the latest edition in Amsterdam at the end of November. Our mission? To further promote the use of fluorescent packaging among brand owners. Representatives of various major brands discovered the numerous possibilities of our fluorescent pigments and their response was enthusiastic. Naturally, we took the opportunity to present our fluorescent pigments for plastic food packaging (RPCF). In February we are invited as guest speaker at European Food and Beverage Plastic Packaging in Berlin. To be continued! … are seen 75% sooner than conventional colors. … hold the consumer’s attention 116% longer than conventional colors. … bring consumers back for a second look. … attract children. Young girls are attracted the most. ... have an energetic and sparkling image. Radiant Color is the European market leader in the development and production of fluorescent pigments. Our innovative company exports to more than 60 countries worldwide and emphasizes partnership, co-creation, innovation and service. The use of formaldehyde in finished product will change according to CLP (Classification, Labeling and Packaging of substances and mixtures). Normally, this would take effect from the 1st of April 2015, but according to new regulation (2015/491/EC) this will be postponed until the 1st of January 2016. Formaldehyde will be classified as carcinogen 1B in Europe. This means formaldehyde is presumed to have carcinogenic potential for humans – this classification is largely based on animal evidence. In the US, formaldehyde has been classified as a known carcinogen for several years. On the other hand, Radiant Color decided already several years ago to develop 100 % formaldehyde free fluorescent pigments, which are fully commercial available. If you need technical advice, don’t hesitate to contact our sales department.